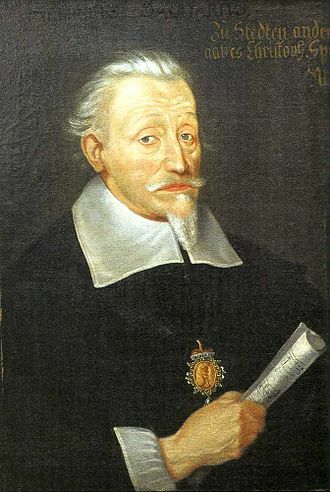 One of the two or three most significant composers of the 17th century, Heinrich Schütz (1585-1672) during his long life wrote the earliest opera in German (alas, the music is lost), and a brilliantly challenging book of Italian madrigals as his “doctoral dissertation” when graduating from the tutelage of Giovanni Gabrieli. Other than these two secular works, almost everything that survives is sacred, much of it written under the harrowing conditions of the Thirty Years War (1618-1648), which so depleted musical forces that he was often required to compose motets for very small ensembles, even one as little as just two singers, often interacting with a pair of violins and continuo. Many of these were published in the two sets of Kleine geistliche Konzerte (“Little Sacred Concertos”), 1636 and 1639. One of his largest works is a quasi-dramatic musical narration of the Christmas story, as drawn literally from Matthew and Luke and bearing the title “The Story of the Birth—Joyous and Full of Grace—of God’s and Mary’s Son, Jesus Christ,” or more briefly, the Weihnachtsgeschichte (“Christmas Story”), printed in Dresden in 1664 and first performed there (according to court diaries) on December 25, 1660. The Christmas Story narrates the Gospel account through the use of a tenor soloist as the Evangelist (a device familiar to most music-lovers from the later Passions of Bach). For actual dialogue in the Biblical accounts, one or more singers would represent the participants, be they angels, shepherds, high priests and scribes, or King Herod. Each of these speeches is presented as a separate musical number, with a specific group of instruments symbolically representing the soloist(s), thus providing a great deal of varied color in the score. Still, the bulk of the work is the Evangelist’s narration, which is kept instrumentally spare to allow the singer’s voice to carry the story throughout the church. Like the Bach Passions, the Schütz Christmas Story was intended as a liturgical piece performed during a church service by musicians performing as if in a concert. But this year, on the day after Christmas several ensembles joined for an unusual performance. Appearing together in First Church in Cambridge, Musica Nuova, a choral group founded by Amanda Keil and evidently (given the admitted derivation of their name from Caccini’s Le nuove musiche of 1600) specializing in music of the 17th century; the Weckmann Project, an instrumental ensemble directed by Liza Malamut, named after one of the students of Schütz best known as a composer of instrumental music; and Long & Away, a trio of viols, presented the Schütz Christmas Story in a theatrical format directed by Julia Mintzer, with Jeffrey Grossman as Music Director, rather than attempting to recreate a liturgical framework. A delightfully welcome feature allowed children under 10 to be admitted free at 4 pm; a special seating area on the floor next to the raised platform gave them an excellent view of the goings-on. The attention of these youngsters (many of whom were well under ten) impressed me, especially given that they did not know the language of the singing. Still, the ample movement, gesture and formal groupings familiar to many of the children from home crèches or church displays could convey a sense of the narrative. The orchestral ensemble was placed in the crossing to the left of the audience, where it was also closest to the organ console. The chapters of the story were enacted in the central area of the raised “stage” by members of the vocal ensemble moving on and off to take up positions with simple costumes and props. The Evangelist narrated the story to a young boy who, later in the tale, when Jesus and his parents return from their self-exile in Egypt, suddenly represents the boy who has grown beyond the doll representing the infant in the manger. The musical program included several appropriate works to frame the major Schütz piece. A 7-part Canzona by Schütz’s teacher Giovanni Gabrieli served as a kind of overture. Then three selections from the Kleine geistliche Konzerte presented elements of the story that are not included in the Christmas Story itself. Sei gegrüsset Maria, du Holdselige (SWV 333) is a dialogue between Mary (sung by Elise Groves) and the angel of the Annunciation (Clare McNamara, singing from the balcony behind the audience) unfolded the scene from the first chapter of Luke in which Mary learned of her pregnancy and how it came about. The angel’s part lies very low for a female alto; most likely Schütz would have used a countertenor, for whom the same pitches would have been much higher in range. Immediately after this, Joseph learns from three angels (Erin Brittain, Amanda Keill, and Paul Guttry) that he must conclude the wedding with Mary, whose pregnancy has a divine origin (Joseph, du Sohn David, SWV 323), whereupon the same trio sings a prayer drawn from Isaiah (Rorate coeli, SWV 322). At this point, the Christmas Story, running just under an hour, took up almost the rest of the program. Happily Jason McStoots, one of Boston’s finest tenors in this kind of role, proved entirely at home in the large role of the Evangelist; he shaped the wordy recitative with an easy flow and superb diction. During most of the performance, though, he seemed focused on telling the story to the young boy with him instead of projecting to the audience, except in the final passages, when “young Jesus” leaves him after his family’s return from Egypt. From this point on, the Evangelist’s narration could not have been more beautifully sung and projected. As the story continued, different groups of singers from Musica Nuova served by turn as the multitude of (six) angels singing to the shepherds, the (three) shepherds themselves, identified by the crooks they carried, the (three) Magi who come to ask Herod where they may find the new-born king. Herod is troubled and seeks out (four) high priests and scribes for advice whereupon Herod (solo, Paul Guttry) urges them to return to him when they have found the child. But after the Wise Men present their gifts, an angel (Mary Gerbi) warns Joseph to take his family to Egypt, and later to return to Galilee, where they settle. Here the entire ensemble, chorus and orchestra, intone the closing words of praise to God. As a final concluding number, the program offered an 8-voice setting by Michael Praetorius of In dulci jubilo, a 14th-century macaronic hymn with alternate lines in Latin and German; the tune is best known to English speakers as “Good Christian men, rejoice.” Praetorius’s setting elaborated it into a festive close to the program. The idea of dramatizing the Christmas Story seemed attractive on the face of it, and the many lovely touches helped the audience follow the account, especially if they were not reading the text and translation in the program book. To some degree, though, I think the space—both its size and its acoustics—defeated the plan for a clear theatrical depiction of the birth story. With the orchestra off to one side, and the constant motion on and off the stage as different groups of singers came on to represent different characters (not always with a clear identification) the ensemble tended to be ragged, and sometime the instruments overwhelmed the vocal ranges and texts. A purely concert performance, with all forces placed in idea relationship acoustically, would, I think, have served the music more satisfactorily. Still, the idea was certainly worth trying, and I remain amazed (and delighted) at the focus maintained by the children sitting on the floor. The audience also clearly appeared pleased with the opportunity to hear this richly colorful account of a major work by the greatest German master of that century.